DEVONthink’s developers released its next generation sync technology this week. The sync technology is baked into the latest DEVONthink 2.9 update, and will be included in the upcoming new version of DEVONthink to Go, the iOS app. After being a weakness for years, DEVONthink’s sync is now a strength. Could Google be launching a competitor to Evernote and Springpad? Google scrapped its Notebooks app quite some time ago, but according to a story on the Verge yesterday, it looks like the company might be ready to get back into the note taking app business. Would you give it a try? Usually, I like to pull out new apps for the App of the Week. Every once in a while, though, one of my favourites releases something so cool that I have no choice but to add the “extra-special” label. For the second time this week, Springpad pushes itself into the 40Tech stream, first with a slick integration into the iOS 5 notifications system, and now by adding yet another level of personalization and social value to their service. 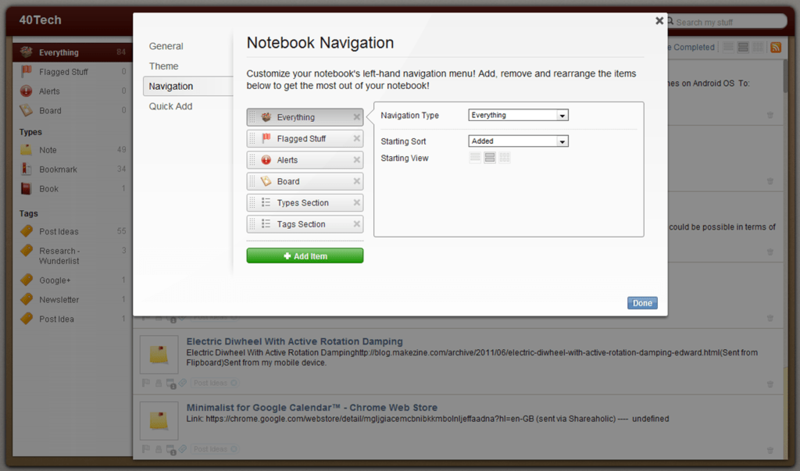 Note: Notebook customizations show up in the most recent versions of the mobile apps: iOS 2.6+, and Android 2.4+. The ability to easily customize your notebooks so that you see only what you want in the sidebar, and cut the extra steps out of the Quick Add process. 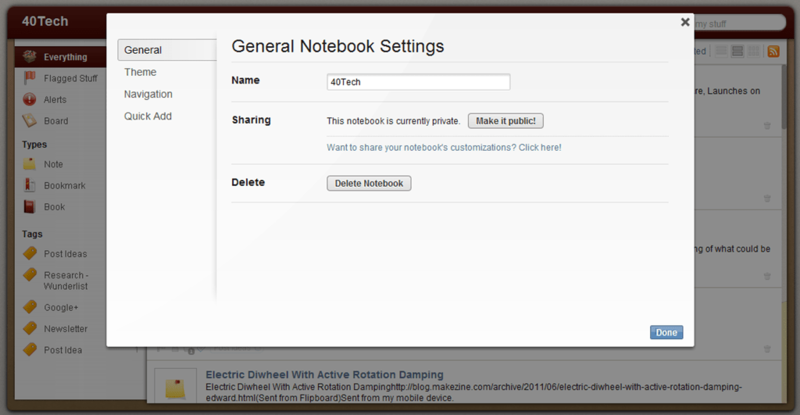 Customizing your Springpad notebooks is easy. All you need to do is hover over the notebook (or the open notebook’s title bar) until you see the little wrench appear by the name, click said wrench, and head to either the Navigation or Quick Add button that appears in the pop up settings dialogue. 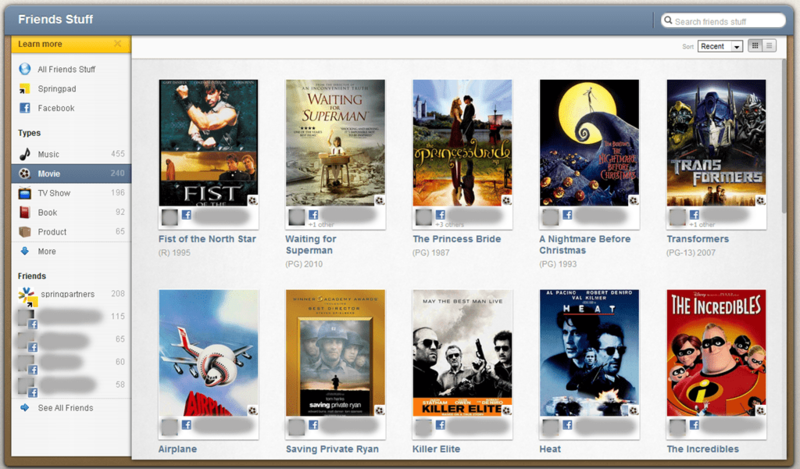 Click and drag the navigation items to reposition them or delete them completely. Change the item-type without moving anything (change Everything to Board, for example). Change the way notes are sorted when you open that navigation item (by Added, Modified, Tag, etc.). Change the Starting View for that navigation item to default as title-only, title-with-description, or grid. Different navigation types will have different options, depending on their function. For example, the Types Section and Tags Section also allow you to decide how many of their items to show in the sidebar, as well as to decide if you want to sort by note count or name. That last bit, alone, will make life easier for those who use GTD in Springpad, and the other features won’t hurt either. This is where things get fun. The best thing an app like Springpad can do is make it as fast and easy as possible for you to get things into it. Springpad was already pretty good at this, especially via their mobile apps, but sometimes it was a bit of a pain to select notebook, then select item type (or change item type, if Springpad’s auto-select got it wrong), etc., etc. 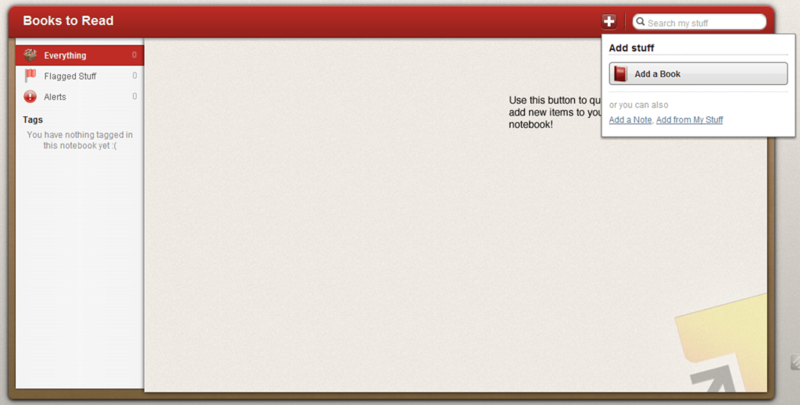 Now you have the ability to make sure that the notebook only shows the options that you need to see. 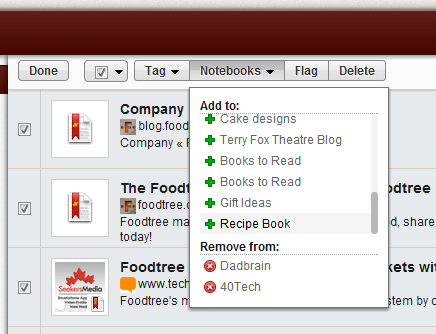 You can select by the standard add a Note, Task, By Type, Look It Up, et al, as well as by Recipe, Book, Movie, and more. 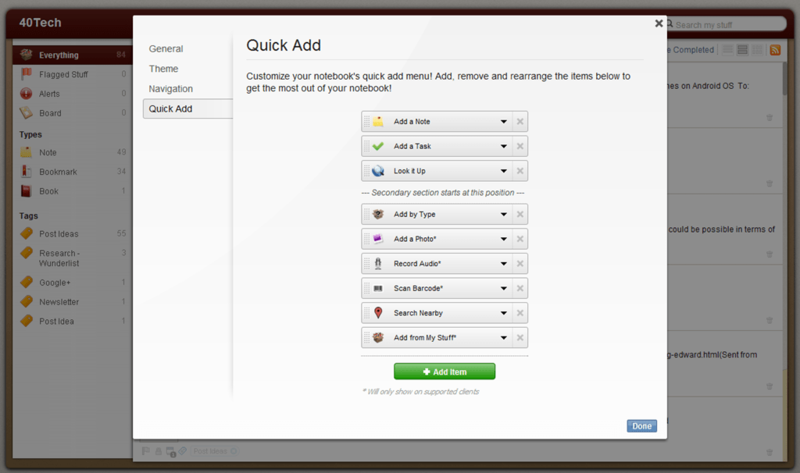 You can also choose client-specific options. This is fantastic if you do most of your collecting for that notebook by mobile, as you can then set it to collect only by Photo, Audio Recording, Barcode, or Search Nearby. Please note that Android devices currently do not allow adding alarms, contacts, or events, and mobile devices in general do not allow adding from My Stuff. Quick Add can be used to filter these items out. The ability to save your new notebooks as a template for other notebooks, share it with others, or easily adopt their shared templates. Once your notebook is customized just how you like it, you can use it as a template for new notebooks by selecting it from the “Choose template for this notebook” dropdown menu (in the same place you name the new notebook). All you have to do here is open up the settings, and click where it tells you to get the share link. None of your notes are shared, or any other private information, only the template. the link will lead to a page that allows people to Spring and install the theme. Add it wherever you like to add links: Twitter, Facebook, Google+, your blog, a public Springpad notebook just for templates — wherever. 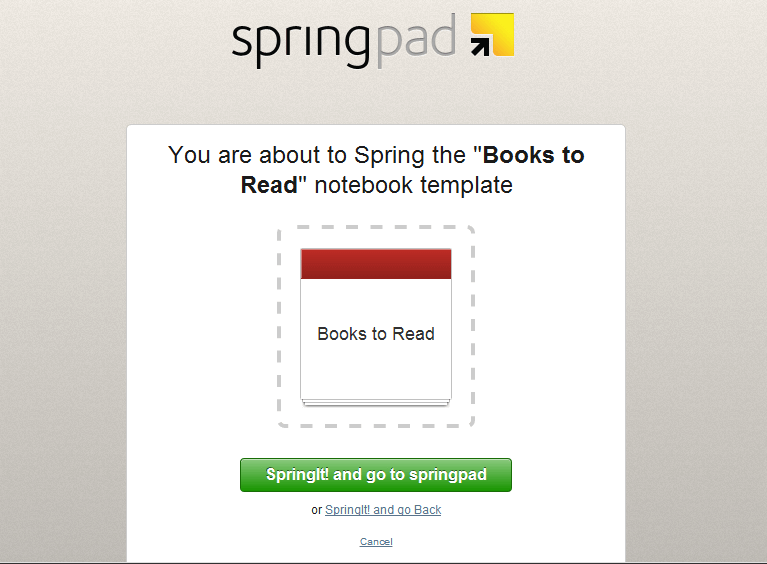 Springpad already has a few templates available on their blog that can get you started, complete with ideas on how to make the most of them on the web and on the go. Check them out, and follow the prompts to install them: Gift Ideas template, Recipe Book template, Books to Read template. Share your custom notebook templates in the comments! In case you haven’t heard, Springpad has integrated Facebook into Friends Stuff, so you can easily check out and add your friends’ Likes and Check-ins. We’re talkin’ movies, books, TV shows, music, places, and the like that your real-life friends recommend; easily viewable and sortable in your Springpad app, and easy to add to your own notebooks for later access. The Friends Stuff Facebook integration is in beta, but if you click the link in the Homecreen’s sidebar and authenticate with Facebook, you should be able to get connected. At the very least, you will be put on the list and Springpad will send you an email to let you know when you can access the new feature. So yeah… That’s a lot of Springpad awesome for one day. Kudos to CEO Jeff Janer and the entire Springpad crew for continually thinking of and adding new ways to make their service useful and unique. I can’t wait to see what they do next! What do you think about Springpad’s new additions? The past couple of days we’ve talked about Markdown, a markup language that helps you easily output HTML without having to learn HTML. Yesterday, we looked at a Windows app, WriteMonkey. Today, it’s the Mac’s turn. One of the earliest apps that I downloaded on my Mac was nvAlt, a note taking app. I was impressed by the unique and efficient way that nvALT operated. Well, technically it isn’t unique, since it is a fork of an open source app, Notational Velocity. But it is different than most note taking apps that I’ve used. What I didn’t know until recently was that it also supports Markdown.